'Mr Kerry, I am so tired of all this.' 'Mustafa' (not his real name) was expressing his frustration and despair at his situation — not an uncommon experience I find. He is an asylum seeker and we are working on his case together. I think his case is a good one. He is a middle class Iraqi from Baghdad who fled because of the extreme violence there a few years ago. He was in Dubai for a few years before coming to Australia to do his postgraduate study. He is too afraid to return to Iraq after what he experienced there. He could not stay in Dubai as the UAE is not a signatory to the refugee convention, so he needed to find somewhere else to go. He applied for visas and was able to get a student visa for Australia to improve his skills with postgraduate study. Mustafa speaks very good English, and his professional skills are going to help him get work in Australia. He is not going to take an 'Australian's job' — he will work and contribute to the economy, as we all try to do. His education and work experiences will be valuable to pass on to new workers in his profession. He is only at the start of the process here, but his story of fleeing sectarian militias and gangs in Baghdad goes back several years. He can recall the kidnapping he endured, his fears he would be killed, and the need for his family to raise thousands in cash to free him. Many Baghdadi people paid ransoms for the release of their relatives only to have to see their relative at the morgue. Mustafa was lucky — he was released. Mustafa is also 'lucky' because he has a good case as a refugee, and his skills and English mean he will find work and settle in fairly quickly. The best thing is he gets a permanent visa, not a temporary protection visa, because he did not come on a boat, but by air on a student visa with his wife and son. The situation for 'Ali' is far less certain. He came on a boat three to four years ago after being registered and approved as a refugee by the UNHCR in Indonesia. He saw no movement in resettlement from Indonesia so he came to Australia. He is now one of the thousands who, if they can prove their refugee case, only get a temporary visa, not a permanent one. "His wife thinks he has abandoned her because she cannot believe a developed country like Australia with a good human rights record is not letting her husband sponsor his wife to come." His case is harder legally than Mustafa's because the law changes in December 2014 mean that boat arrivals in the 'Fast Track' group have much fewer rights on review than those arriving with a visa. The system makes it easier to refuse cases and it is likely it will be harder to win court appeals, as the review grounds have narrowed — a further example of how we punish boat refugees. Ali is also very tired and recently sought permission to visit his wife and child, who he has not seen for nearly five years. Although he cannot sponsor his wife and child to Australia on a temporary protection visa, he can visit them in a safe third country; some Iraqis and Afghans are meeting family in Iran for example. However getting the permission just to see his family was a major exercise — he needs to prove this visit is warranted and then, if the case officer agrees, he will get a short period of time (maybe two months) to spend with his wife. What is worse for him is that she thinks he has abandoned her because she cannot believe that a developed country like Australia with a good human rights record is not letting her husband sponsor his wife to come. She does not realise that allowing Ali to sponsor his wife would be seen as 'letting the people smugglers back in with their business model, and people would die at sea'. Therefore, better to prevent a couple from being together, and not give a refugee hope of security here, as a punishment of that refugee for coming on a boat and a deterrent to others. What is not considered in this policy is the stress on their relationship. Their relationship has been tried by their forced separation, but now her family have put pressure on her to divorce him, they believe he has a new wife here, which is why he has not sponsored her. He does not. He simply is only on a TPV and with no prospects of a permanent visa or being able to sponsor his wife here whilst he tries and settles in to life in Australia. All he can get now is another temporary visa and he needs to fit into the skilled visa categories to get anything more permanent. Ali's English is not as good as Mustafa's , and although he has some skills, he will need retraining in order to work here. He knows that his situation is temporary – even though he has been accepted as a refugee in Australia. No wonder he is stressed and tired. We have heard of several asylum seekers who have given up because of the stress, and uncertainty they face. Some returned to their home country to take a chance, others have taken their own life in despair. The process of resettlement for refugees is not easy, and they have to face the hostile politics in this country, on top of whatever trauma they experienced before fleeing their home country. The area is a complex one and warrants careful and humane systems, not simplistic slogans and harsh punitive laws or subcontracting our international obligations to poor former colonies in the Pacific. As we celebrate the great achievements of refugees in our community in Refugee Week, we should also remember that our policies are slowly wearing people down and in some cases destroying them. We can do, and have done better than this. And as John Olsen, SA premier in 2000, said ''they are all just refugees''. If Ali was deemed by the UNHCR to be a refugee it's not up to Australia to pretend otherwise. 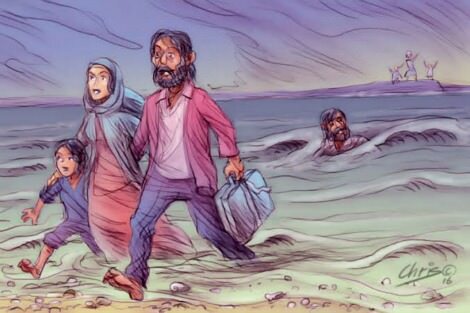 Isn't it ironic that refugees make long and perilous journey to reach Australia because we are a signatory to the Refugee Convention! Thanks, Kerry, for these human stories.